How Long Does it Take a Boxwood Shrub to Grow Back After Trimming? Boxwood shrubs are evergreen plants that have a naturally boxy or rectangular shape. They are often used to create hedges and privacy screens around yards, but they are also planted individually. As with all shrubs, boxwoods require more water when they are first planted. The reason is that the root system has not grown deep enough to seek out water. If adequate water is not supplied to the new shrubs, they will begin to deteriorate. Water the new boxwood shrubs immediately after planting to a 6- to 8-inch depth, or the same depth as the root system of the shrub. Turn on a garden hose at a slow trickle, and lay the end 6 inches from the base of the shrub. Leave the hose there for at least 10 minutes. Check the moisture level by digging into the soil next to one of the shrubs to ensure it is moist at a level of 6 to 8 inches. If the soil is not damp to the proper depth, allow the hose to run longer. Repeat the watering process as often as need to keep the soil moist for the first year of growth. In the spring and fall, this may require watering only once per week. In hot summer months, increase the watering frequency to every two or three days. Phytophthora Root Rot is a fungal disease. English boxwood decline is a fungal disease that usually attacks plants over 20 years old. Volutella stem blight is a fungus disease of the twigs and leaves. Phytophthora root rot causes leaves turn light green then yellow, bronze or straw colored. The leaves also turn upward, and the margins roll to the inside. English boxwood decline has the same symptoms. With Volutella stem blight, the leaves on the tips of the twigs will turn orange or bronze in early spring. Twigs will die back. Phytophthora root rot is caused by too much moisture from over-watering or heavy rains. English boxwood decline happens when the plant suffers stress from a drought situation. Volutella stem blight usually occurs when the plant has been damaged during the winter, usually by frost. Phytophthora root rot can be prevented by planting in well-drained soils or on a raised bed. English boxwood decline can be prevented by giving the plant a deep watering during drought on a regular basis. Volutella stem blight can be prevented by proper mulching. With Phytophthora root rot, seriously infected plants should be removed and destroyed, and the soil should be drenched with fungicide. With English boxwood decline, there is no treatment. New plants should not be planted in the same place. There is no fungicide for Volutella stem blight, but if the damage is not severe, the plant will grow new leaves. Decide how large you would like your boxwood shrub to grow and if you're using it as a hedge or a decorative shrub. Decide into which shape you are going to prune the boxwood shrub. You can make it square, rounded or cone shaped. Prune off the tips of the stems only, or about 1 to 2 inches, until you have your desired shape. Do not over prune. If you need to prune off more than just the tips, gradually do so over a period of time so the boxwood shrub can recover, according to North Carolina State University Extension. Clean the blades of the pruning loppers and garden shears thoroughly with the rubbing alcohol and a clean rag to avoid spreading fungus and disease from plant to plant. Prune the boxwood deeply during late spring to remove any dead branches. Determine the shape desired for the boxwood plant, for example a circle or square, and use the garden loppers to rough in the shape, cutting exterior branches near the leaf buds if possible. 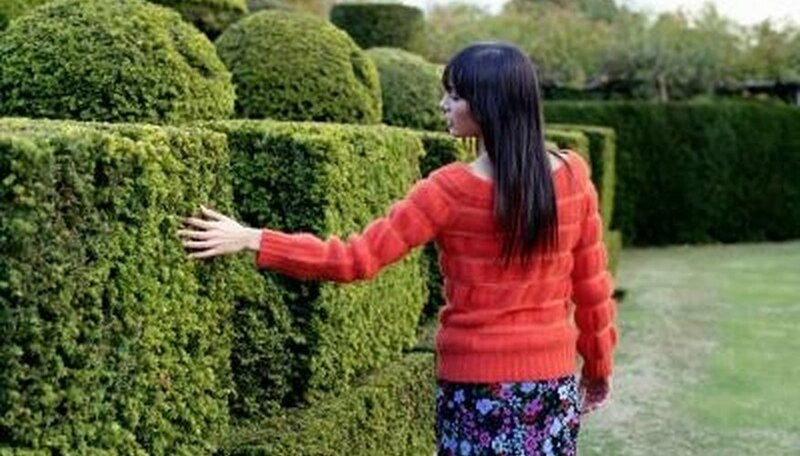 Avoid cutting too far into the interior of the shrub until the boxwood plant has been established for several years in the planting location. 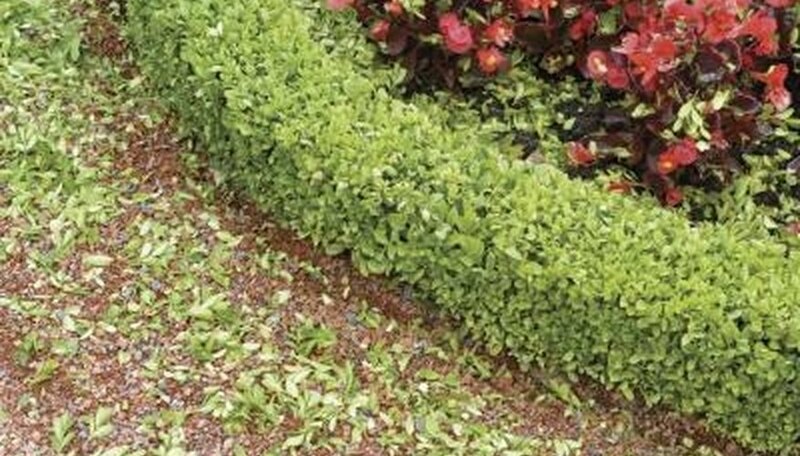 Refine the shape of the boxwood shrub by trimming small branches with the garden shears during the summer growing season. Water the shrub thoroughly after trimming and during periods of dry weather. Boxwood shrubs do not recover quickly after a severe trimming and are often slow to respond. It takes the boxwood years to recover and grow back, so sticking to a light trimming or pruning is best. Examine the leaves to determine the nature and extent of the damage. This will help you determine whether the tree is worth saving. In most cases it will be, so long as at least a third of the bush looks reasonably healthy and alive. Determine whether the boxwood has received too much or not enough watering. During periods of drought, boxwood decline can set in, whereas not enough water can cause root rot. Both will result in yellow and brown leaves. Understand that parasites called nematodes cause yellowing of leaves as well. Nematodes cannot be seen by the naked eye. Look for yellow leaves, which were first orange or bronze, on the tips of twigs. This likely means your bush suffers from stem blight. Understand that there exists a disorder among boxwoods which turns otherwise healthy, green leaves marginally yellow for which no cause has yet been identified. This disorder does not seem to affect the shrub, however, and is not a cause for concern. The boxwood leafminer was introduced into the United States from Europe and commonly infests American boxwood, English boxwood and Japanese boxwood. Boxwood leafminers emerge in the early spring and are tiny, orange flies. These flies swarm around boxwoods and lay eggs in the boxwood leaves. Tiny maggots hatch inside the boxwood leaves. These maggots are typically 1/8 inch long and are yellow in color. Boxwood leafminer maggots feed on the inside of leaves until they turn into pupae. Once mature, the pupae emerges as an adult fly. Boxwood bushes infested with boxwood leafminers have water-soaked blisters on the lower portion of the leaves. These leaves are typically smaller, off-color and drop prematurely. Although boxwood bushes are not usually killed by infestations of the boxwood leafminer, heavy infestations can cause poor color and thin foliage development. Boxwood bushes infested with this pest generally have reduced vigor as well. Planting boxwood bushes that are less susceptible to the boxwood leafminer is one way to prevent infestations. Slower growing boxwoods such as the English boxwood, Pendula and Suffruticosa are somewhat resistant to this pest. There are natural predatory insects such as green lacewigs and parasitic waps that feed on boxwood leafminer keeping them under control. Chemical control methods are often effective in controlling heavy infestations of boxwood leafminer. Pesticide sprays and soil drenches are available at your local garden center for leafminer control. These products are most effective if applied during the spring just as the boxwood leafminer begins to fly. When & Trim Bushes & Shrubs? When to Trim Yellow Bell Bushes?